Over the last five years, a gradual shift is observed toward open source environments for a number of advantages over boxed open sources. Factors of lower cost, flexibility, security, performance, and community support for open source operating systems, primarily Linux distros have largely been driving this shift across organizations. Microsoft has embraced this industry trend and has been continuously working with providers hand in hand to contribute and strengthen the community. All major platform providers of Linux have also witnessed frequent release upgrades, assuring the developers with continued support. With all the more increasing adoption of Linux worldwide, a large number of organizations are moving their mission-critical workloads to Linux based server machines. Azure Site Recovery (ASR) has always been onboarded with all major Linux server versions on VMware and/or physical machines for disaster recovery. Also, over the last six months, it has continued to put a keen focus on extending support for the latest OS version releases from multiple providers such as Red Hat Enterprise Linux (RHEL), CentOS, Ubuntu, Debian, SUSE, and Oracle. ASR started supporting RHEL 7.5, 6.10, and 7.6 from July 2018, August 2018, and January 2019 onward. Support for SUSE Linux Enterprise Server 12 (up to SP3) was added in July 2018 after the success of SP2 and SP3 releases and wide usage for critical workloads. ASR started supporting CentOS 6.10 from August 2018 and 7.6 from January 2019 onwards. Latest versions of Oracle Enterprise Linux versions 6.8, 6.9, 7.0, to 7.5 and UEK Release 5 were added for support in November 2018, followed by OEL versions 6.10 and 7.6 in January 2019. In addition to the above release updates from providers, Linux OS in terms of file systems and partitioning methods have been enhanced. ASR has been watching out for these enhancements and their industry adoption on VMware and physical Linux machines. In 2018, a large number of implementations moved to GUID partitioning table (GPT), allowing for nearly unlimited number of partitions. It also stores multiple copies of boot data which makes the system more robust. ASR started supporting GPT partition style in legacy BIOS compatibility mode from August 2018 onward. Custom usage of Linux has also evolved variety in system structure. Some specific scenarios include having /boot on disk partition (and on LVM volumes), having /(root), /boot, /usr, /usr/local, /var, /etc directories on separate file systems and separate partitions that are not on same system disk. ASR added support for these customizations in November 2018. 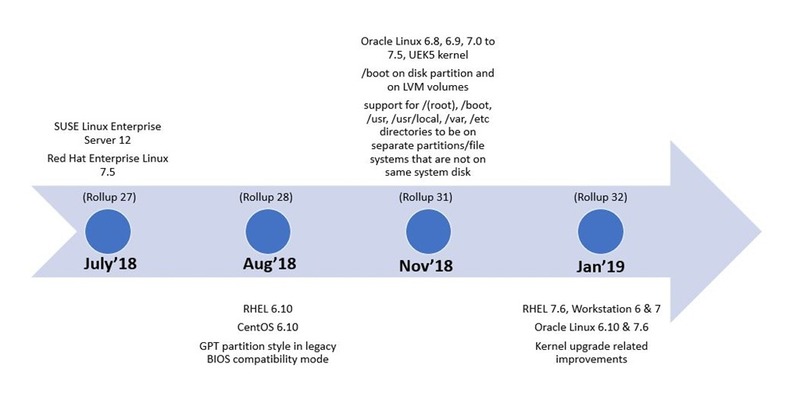 Below, the timeline captures the Linux support extended by ASR since July 2018 for VMware and physical machines. Learn about the supported operating systems for replicating VMware virtual machines. Get started by configuring disaster recovery for VMware machines. Need help? Reach out to ASR forum for support. Tell us how we can improve ASR by contributing new ideas and voting up existing ones.